Hailing from Greater Damansara (i.e. Kepong), he graduated from Sekolah Menengah Taman Bukit Maluri. Firm believer of always being prepared, he excelled as a boy scout (no really, he was) and excelled at athletics, notably middle and long distance running. Growing up, he harboured great ambitions to become an archeologist, hunting for ancient treasures (a la Indiana Jones). Ended up in a profession where the only digging he does now is for cases containing ancient principles. He obtained his Bachelor of Laws degree from the University of London on 1 August 2001. He thereafter obtained his Certificate of Legal Practice and commenced pupilage at Messrs Raja, Darryl & Loh. Sashiraj was called to the Malaysian Bar on 20.10.2005. He was retained by Messrs Raja, Darryl & Loh as a Legal Associate in their Dispute Resolution department. He was a Senior Associate in Messrs. Raja, Darryl & Loh before leaving to become one of the founding Partners of Raj, Ong & Yudistra. 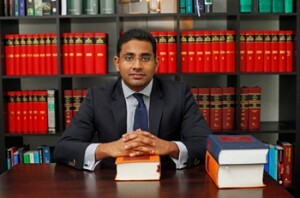 Sashiraj’s practice spans a wide variety of laws and subject matters, making him a specialist in complex litigation. Whilst having vast experience and familiarity within the appellate and apex Court of Malaysia, he also does cross-border disputes and advisory work involving foreign entities. Outside of litigation, Sashiraj is a reputable consultant to several SMEs, heavy industry players and even oil & gas companies for compliance-related and legal issues. To this end, he has represented and drafted several shareholder, partnership and acquisition-related agreements for his regular clients in various industries. Sashiraj has also occasionally given talks to junior lawyers and pupils at the KL Bar. He has also contributed a chapter in The International Comparative Legal Guide to Patents 2011; A practical cross-border insight into patents law. When not arguing at Court, he is a homely, family man with a penchant for yoga, classic movies and a connoisseur of vintage and rare watches. Unsurprisingly, he is a stickler for time-keeping and considers it the height dishonor to arrive late for an appointment. He is a religious devotee who believes in moderation (especially when it comes to spicy food, getting wet from the rain and alcohol) and finds comfort in traditions, rituals and family gatherings (with his Klang cousins).